The breed’s coat is short but not smooth (like the coat of a cow), very coarse and thick in order to be perfectly waterproof. It can be black, gray, fawn or red, with brindle variations and a black or gray mask also acceptable. Make no mistake: This is a whole lot of dog, both physically and temperamentally. They’re smart, trainable, eager to please, versatile, and docile and intensely loyal with their humans, especially children. The Cane Corso is a native of Italy, where they played watchdog and hunted wild boar. Prior to 1988, the Cane Corso was known only in southern Italy, and was considered very rare, but has still been featured in many paintings throughout Italy’s history. The Cane Corso is easily trained because of its extreme intelligence. As a large and athletic breed, they need a lot of exercise. They are affectionate to their owner and bond closely with children and family. Cane Corsos are light shedders, which make grooming simple all they need is an occasional brushing. Working Group; AKC recognized in 2010. Ranging in size from 23_ to 27_ inches tall at the shoulder. Moderate daily exercise is fine. 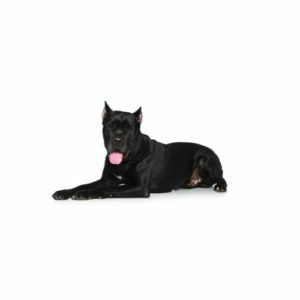 Do you think a Cane Corso could be right for you and your family? Check out our available puppies page to see all of our adorable Cane Corso puppies for sale! Are you interested in purchasing a Cane Corso? By clicking “yes,” I authorize Petland Fairfield and Third Party Pet to deliver or cause to be delivered telemarketing text messages using an automatic telephone dialing system. I acknowledge I am not required to sign the agreement (directly or indirectly), or agree to enter into such an agreement as a condition of purchasing any property, goods, or services. I may opt out of text messages at any time by texting "STOP". Standard message rates apply. Petland Fairfield https://www.petlandfairfield.com Petland Pets Makes Life Better! 5.0 6 based on 6 ratings.